This course is a perfect mixture of basic and intermediate studio & lighting techniques. It is designed to teach students to accurately manipulate lighting in order to get exact results as well as to make creative studio imagery from portraiture to product. I will admit I was a little turned off from the start: during introductions in the first class, I said I enjoyed shooting sports cars and the instructor snapped back she would not be teaching us how to light cars. However, having now been through two sessions, I realize this is an entirely different type of photography versus what I’ve done in the past. Having complete control of the lighting and exposure like you do in the studio is exactly how I’d want to shoot product photos, whether they were individual car parts or whole vehicles. While I’ve enjoying doing the race track panning shots in the past (and will likely continue that too), doing product photography is something I’d like to try. It is also probably my best chance to make money (if I started pursuing photography for that). Overall, I’ll learn a lot from this class regardless and the knowledge should be helpful in the future, whether directly or indirectly. Today I was able to install Gallery2 and integrate it with WordPress through the WPG2 Plug-in. It took me a while to align everything correctly, but I’m relatively happy with the results. Finally instead of posting archives I can have all my shots viewable without download. Over the next few days, I’ll be going through old posts and uploading my photos to albums in Gallery. I’ve already done this for Intro to Photography Homework 2, and I’ve also posted an album with my shots from Homework 1. The next class after our 36-shot assignment was a critique of everyone’s work. I thought my pictures stood up pretty well to the rest of the class although it was clear several of them could have been much better. Several students commented on different shots. 2851: compared to 2829, this was a much stronger image due to the composition and contrast. This was somewhat surprising to me as this shot was a complete one-off for me. 2876: this dark shot of a creepy looking tree was strong. The contrast between the background and the leaves and trunk is distinct. The shadows on the tree make it look dark and a scary. The branches provide plenty of lines for the viewer’s eyes to follow. 2882: this was a strong image due to the contrast of the dark leaves against the bright sky and details (like the tiny holes) you can see in the former. The castle is blurred but you can make out of the shape of the window in the background. 2804: I liked this shot looking past the stone castle out over the park and the high-rise buildings far in the distance. The diagonal line of the stone blocks led down to all the people in the park, and the medieval column architecture is juxtaposed with the modern buildings in the background. 2801: I thought this shot was a good look at all the geometric shapes in the architecture of the castle. The composition had decent negative space around the building and held the main tower at the left third. Overall, this was another good learning experience. For the amount of time I spent on the assignment and the total number of shots I took (~110), I had six or so strong images. Our fourth homework assignment for Intro to Photography was to take 36 pictures (a full “roll”) of a single object. Our chosen object did not have to be the primary subject of every shot, but the idea was to think about perspective and composition and view the object many different ways. I wanted to use my car for this assignment, but due to a failed inspection and a general bad mood last weekend visiting my parents at home, that didn’t work out. In the future, I may do this assignment over and use my car to see if I can develop a better set. For my target, I settled on the Belvedere Castle in Central Park. This castle sits at the second highest elevation in the park and hosts a weather station. I was a little pressed for time and took just over 100 shots on Sunday afternoon. From those shots I’ve selected 38 to print for class. Out of what I’ve chosen, I think about five are relatively strong images. I’m disappointed in several but basically ran out of time and wasn’t as dedicated to this assignment as I could have been. Update: These images are now available in Gallery. Our third homework assignment for the Intro to Photography class was to choose a picture from another photographer that we liked and bring it in to class. The class critiqued each picture, pointing out the composition elements we learned in action. 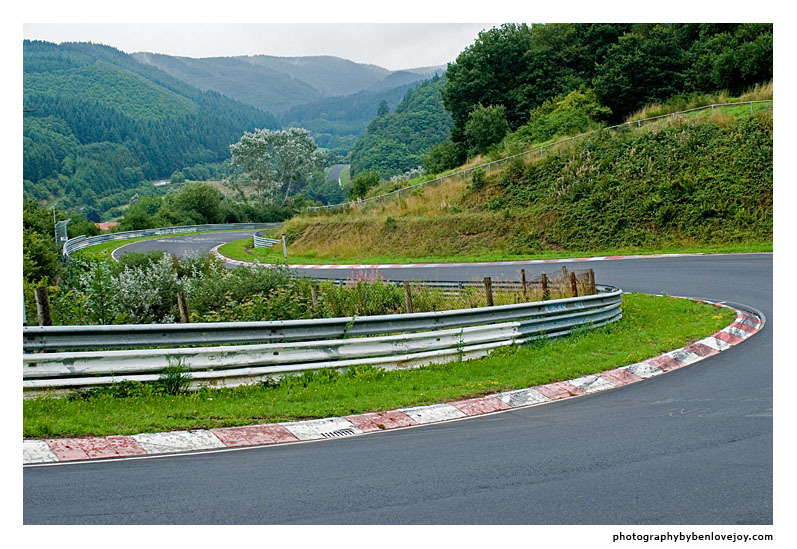 For this assignment, I choose a picture of the Nurburgring in Germany, taken by Ben LoveJoy. The photo I choose can be viewed directly here or you can view it with the rest on this page. The photo is of Wehrseifen on the Nurburgring Nordschleife. I choose this image mainly because of its use of contrast and rule of thirds. The first thing the eye is drawn to is the line between the track and the grass in the foreground of the picture. The curves of the track encourage the eye to weave back and forth through the image. If you look closely, the track continues way into the distance, and above that mountain ranges flow into the further background planes of the photo. The first bend (looking foreground to background) is roughly one-third of the way from the lower right corner of the image, and the second corner is one-third from the top left. This composition really pulls you all the way back into the image and then lets you explore back out again. My selection was validated during the class critique, when another student pointed out exactly the composition techniques I had identified when selecting the image. I received other position feedback from the class and the instructor on the choice. Going forward, the challenge will be thinking about all these composition techniques when I go to take my own shots. At our third session, we critiqued everyone’s homework as a class. I was pleased that everyone liked my 30-second exposure with the playing cards. Somewhat ironically, that was the shot I spent the least time on and took the fewest exposures trying to create. Some of the other students also liked the shot of the subway leaving the station (from outside the train). The instructor commented that my picture freezing the peak of the fountain without showing the base was interesting. Looking back on the 8 shots I picked, I was only really happy with about half of them. My focus is definitely off in my rolling shot. This was due to narrow depth of field (since I was almost wide open trying to take the picture in the dark) and my own error of auto focusing on the wrong spot. My focus was also off in the stove top picture, this time because I actually used manual focus and didn’t take enough time to get exactly what I wanted. I liked the golf ball shot, but I should have used an even faster shutter speed to really freeze things. From the direction the ball is going you can easily tell it wasn’t hit perfectly, which is sub-optimal for the shot as a whole. I was impressed in how the moving subway photo came out because it was a 1″ hand-held exposure braced against a column. The Image Stabilization in my kit lens must have come through for that one. The two shots I tried to get and didn’t were of the Metronome in Union Square (the giant clock slash piece of art on One Union Square South) and the Olafur Eliasson waterfalls in the East River. Getting a motion shot of the Metronome was like trying to date a girl that’s just not right for you – despite going back again and again you just can’t make it work. The digital numbers that make up the clock were too bright to shoot at night and didn’t stand out enough during the day. It was much harder than I thought to show any motion since exposures overlapping the changes of a number just ended up showing the multiple digits transposed over each other. The waterfalls were less challenging but I went to see them at the wrong time of the day. I couldn’t get a properly exposed shot that portrayed the water the way I wanted it. Overall, taking all these slow motion and stop-action shots was a fun experience. Rolling shots are definitely my favorite – I found myself commenting that I liked everyone’s panning photo, even if they weren’t very good. I’m sure I’ll try a lot of these on my own. Update: This assignment is now posted in Gallery. Photography is a pastime that I’ve always liked. Now that I’ve invested in real equipment (a Canon EOS 40D Digital SLR camera) and started taking classes I’m taking the hobby more seriously. This site was created as a place for me to record the progress of my photography education. Here I’ll describe the shoots I go on and any lessons I learn while working to improve my own skills.